AFT, NEA and similar teachers unions have collaborated in creating the narrative that private schools, charter schools, and any other alternatives to government funded public school, is ineffective in execution and would pull valuable resources away from youth education. While well-constructed, well-funded, and well-marketed by unions, the narrative that school choice is harmful to students or education in general, is largely fabricated and the facts seem to indicate that it is statistically untrue. School choice just drains resources from the corrupt unions. Firstly, the movement for school choice is widely supported by the public at large and among young parents and families across racial and ethnic lines. Over 79 percent of African Americans, 76 percent of Asian Americans, 77 percent of Latinos, and 66 percent of whites support the concept. And charter schools enjoy support from 65 percent of African Americans, 61 percent of Asian Americans, 58 percent of Latinos, and 55 percent of whites. Secondly, the idea that moving taxpayer money into voucher programs or charter schools would result in taking money away from students, is factually incorrect. In a Forbes article analyzing educational costs, the cost of educating a student is broken down, and the cost and benefits of school choice policies implemented in Nevada are analyzed. U.S. Census data shows Nevada spent $4,782 per pupil on instruction in 2012. The state’s education savings account envisions giving parents $5,100 per student which given even a little inflation in school spending means that Nevada would not be diverting more than the instructional cost of each pupil removed from public schools. Thus, public schools in Nevada should find that the money that would remain in the schools will be sufficient to cover the costs of the remaining students. This raises a question. If school choice is largely supported by students and families, and especially so amongst the minority groups that unions claim to be trying to help educate. And school choice policy does not cut spending in schools and is ultimately a better allocation of tax dollars in producing the educational results that families, students, and communities care about. Then why are public school teachers and unions in opposition to it? The answer is simple: money. The NEA and AFT bosses each brought in salaries in excess of $400,000, and almost 600 staffers at those respective organizations brought in salaries above $100,000. In order to bring in such egregious salaries for their purely bureaucratic effort, the unions both require that teachers fall in line with their ideological goals at the threat of withdrawn support, increased union dues, and the looming threat of job loss. In fact, in many states without Right to Work laws, teacher’s union membership is compulsory and a condition of employment. With a system like this in place, Democrats can effectively use corruption and crony capitalism to ensure the flow of money remains in the pockets of big bureaucrats and governing officials, at the expense of students and teachers. To make matter worse, their overreach and administrative control means that they can require that teachers fall in line in their blanket opposition to school choice and for liberal politicians, even if it means that both students and teachers are worse off. It will not take away money from student, and it will not take away jobs from good teachers. The only thing that school choice will take away is the control that big teachers unions have over our tax money, over the teachers, the schools, and the students. 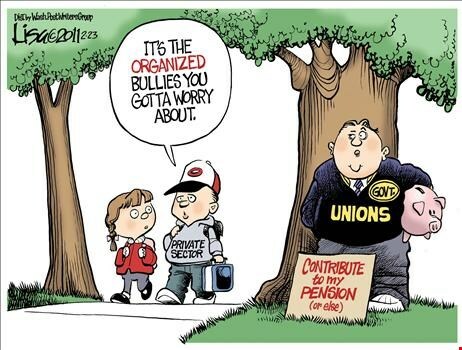 In this regard, unions are right to be scared because public opinion is turning against them. Join the effort to support school choice today, and let your local Rep. know how you feel on the issue of school choice. It merely depends on the Ministry of education of each state. States which consider to closer with the capital spend a fair amount on their education bodies however those states like Nevada, Alabama, Arkansas, North Carolina might have to spend a little more on their overall education structure. Author and editors are contributing on https://www.7dollaressay.com in term of highlighting the occurrence of this much needed reforms on these states. The problem with each document and article on the education reform today is the lack of actual changes that confirm the reform and its productivity. During a decade of arguing and useless talks over public schools and the school choice, the politicians started a giant black hole for the scrutiny and discussions which do not lead to any point so far. Grant Wilson - editor-in-chief and contributor to https://hireessaywriter.org/ and Willson Research Group.